The Arctic Ocean is warmest when the air in the Arctic gets colder. This is when the sea ice north of Svalbard decreases. Researchers have found changes in the physical marine environment that were so great that the ecosystems north of Svalbard have changed. 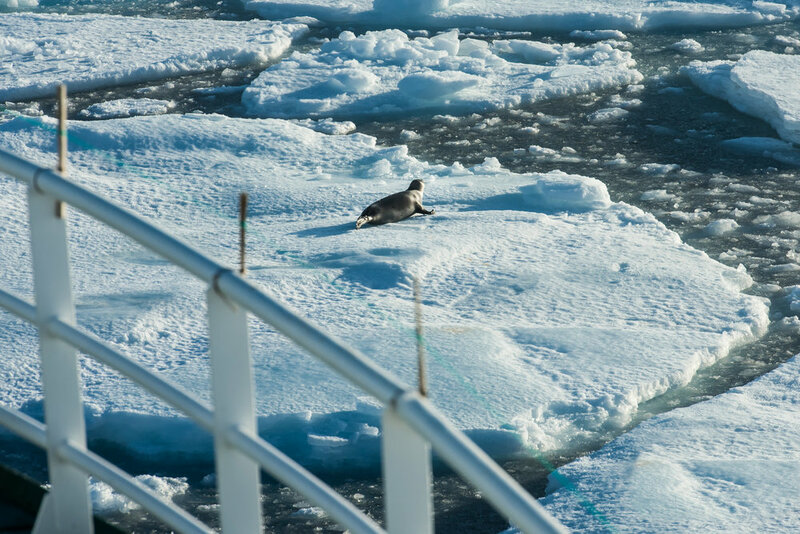 Helge M. Markussen writes about important findings from this project which is part of the Fram Centre's Sea Ice in the Arctic Ocean research program and the recent research paper that shows how the northern Barents Sea is about to shift from an Arctic to an Atlantic climate. A new study shows that the largest influx toward the Arctic Ocean takes place in autumn and early winter and that the water is also warmest at this time of year. "Only if the wind helps by blowing ice and fresh surface water from the interior of the Arctic Ocean or from the east will we see an ice cover on the Atlantic influx. We have been watching the ice cover on the Arctic Ocean become significantly thinner in recent years, along with reductions in distribution in time and space. This also reduces the supply of fresh water from the north," quotes Angelika Renner, an oceanographer at the Marine Research Institute and one of the researchers behind the study. The mechanism that causes the warm and salty waters from the south to remain below the insulating cold and fresh layer of water in the north appears to have been weakened in recent years. Warm water flowing north from the Atlantic Ocean splits into several branches. A large part follows the seafloor topography north of Svalbard to the east and continues into the Arctic Ocean. Illustration©Reibo/Arild Sundfjord, Norwegian Polar Institute & Angelika Renner/Institute of Marine Research. "We see a similar atlantification of the sea to the north and east of Svalbard; less sea ice in the Arctic Ocean leads to less melt-water and thus the warm Atlantic water remains atop the water column for most of the year, staying entirely on the surface. It provides a larger ice-free area north of the Svalbard Archipelago and thinner ice further to the east," quotes Arild Sundfjord, an oceanographer at the Norwegian Polar Institute. Sundfjord and Renner point out that the Atlantic influx brings nutrients with it which are necessary for the growth of phytoplankton and larger organisms such as copepods. "This allows the fish which feed on such zooplankton to survive farther north. So it is not just the physical environment that is changing; the ecosystem is changing as well. Research shows that global warming has sent a number of fish species in the Barents Sea farther northeast, at relatively great speed. We really need to keep our eyes open and monitor what is happening north of Svalbard," quotes Sundfjord. In the autumn and early winter, an extraordinarily large amount of warm water enters the Arctic Ocean north of Svalbard. It stays on the surface, which means no sea ice is formed, even when the air temperature is very low. In late winter, this influx decreases and the surface water becomes colder. A dense ice cover usually forms that can encompass the whole north coast of Svalbard. Illustrations©Reibo/Arild Sundfjord, Norwegian Polar Institute & Angelika Renner/Institute of Marine Research. In an article in the Norwegian newspaper, Aftenposten, Renner and Sundfjord wrote that the wind also plays an important role in how the ice sheet forms. Southwest winds can reinforce the influx of Atlantic water from the south. The wind blows ice and the cold, fresh surface water towards the northeast, which allows for saltier and warmer waters on the surface. At the same time, strong winds help the heat mix more effectively up to the surface and thus can prevent the freezing of ice even at very low air temperatures. "Northern winds cause the cold freshwater and ice to be carried south. In some years, this might lead to ice-covered waters quite far south. We saw this in 2014 when the wind brought ice so far south that several of the expeditions to the Marine Research Institute and the Norwegian Polar Institute entered areas that had been ice-free in autumn in past years," quotes Sundfjord. This research is part of the Fram Centre's Sea Ice in the Arctic Ocean research program, technology and influencing systems (Havisen i Polhavet, teknologi og styringssystemer), as part of the A-Twain Project. It is led by researchers from the Marine Research Institute og Norway and the Norwegian Polar Institute.